A half-wave dipole antenna receiving a radio signal. The incoming radio wave (whose electric field is shown as E, green arrows) causes an oscillating electric current within the antenna elements (black arrows), alternately charging the two sides of the antenna positively (+) and negatively (−). Since the antenna is one half a wavelength long at the radio wave's frequency, the voltage (shown as V, red bands) and current in the antenna form a standing wave. This oscillating current flows down the antenna's transmission line through the radio receiver (represented by resistor R). In radio and telecommunications a dipole antenna or doublet is the simplest and most widely used class of antenna. The dipole is any one of a class of antennas producing a radiation pattern approximating that of an elementary electric dipole with a radiating structure supporting a line current so energized that the current has only one node at each end. A dipole antenna commonly consists of two identical conductive elements such as metal wires or rods. The driving current from the transmitter is applied, or for receiving antennas the output signal to the receiver is taken, between the two halves of the antenna. Each side of the feedline to the transmitter or receiver is connected to one of the conductors. This contrasts with a monopole antenna, which consists of a single rod or conductor with one side of the feedline connected to it, and the other side connected to some type of ground. A common example of a dipole is the "rabbit ears" television antenna found on broadcast television sets. The dipole is the simplest type of antenna from a theoretical point of view. Most commonly it consists of two conductors of equal length oriented end-to-end with the feedline connected between them. Dipoles are frequently used as resonant antennas. If the feedpoint of such an antenna is shorted, then it will be able to resonate at a particular frequency, just like a guitar string that is plucked. Using the antenna at around that frequency is advantageous in terms of feedpoint impedance (and thus standing wave ratio), so its length is determined by the intended wavelength (or frequency) of operation. The most commonly used is the center-fed half-wave dipole which is just under a half-wavelength long. The radiation pattern of half-wave (or most other) dipoles is maximum perpendicular to the conductor, falling to zero in the axial direction, thus implementing an omnidirectional antenna if installed vertically, or (more commonly) a weakly directional antenna if horizontal. Most antennas in use can be seen as based on the dipole. Although they may be used as standalone low-gain antennas, they are also employed as driven elements in more complex antenna designs such as the Yagi antenna and driven arrays. Dipole antennas (or such designs derived from them, including the monopole) are used to feed more elaborate directional antennas such as a horn antenna, parabolic reflector, or corner reflector. Engineers analyze vertical (or other monopole) antennas on the basis of dipole antennas of which they are one half. German physicist Heinrich Hertz first demonstrated the existence of radio waves in 1887 using what we now know as a dipole antenna (with capacitative end-loading). On the other hand, Guglielmo Marconi empirically found that he could just ground the transmitter (or one side of a transmission line, if used) dispensing with one half of the antenna, thus realizing the vertical or monopole antenna. For the low frequencies Marconi employed to achieve long-distance communications, this form was more practical; when radio moved to higher frequencies (especially VHF transmissions for FM radio and TV) it was advantageous for these much smaller antennas to be entirely atop a tower thus requiring a dipole antenna or one of its variations. In the early days of radio, the thus-named Marconi antenna (monopole) and the doublet (dipole) were seen as distinct inventions. Now, however, the "monopole" antenna is understood as a special case of a dipole which has a virtual element "underground". 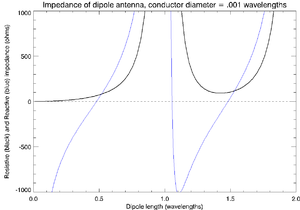 A short dipole is a dipole formed by two conductors with a total length L substantially less than a half wavelength (½λ). Short dipoles are sometimes used in applications where a full half-wave dipole would be too large. They can be analyzed easily using the results obtained below for the Hertzian dipole, a fictitious entity. Being shorter than a resonant antenna (half wavelength long) its feedpoint impedance includes a large capacitive reactance requiring a loading coil or other matching network in order to be practical, especially as a transmitting antenna. ), which is the ratio of a free space plane wave's magnetic field strength to the wave's electric field. We have now expressed the flux in terms of the feedpoint current I0 and the ratio of the short dipole's length L to the wavelength of radiation λ. The radiation pattern given by sin2(θ) is seen to be similar to and only slightly less directional than that of the half-wave dipole. Radiation pattern of the short dipole (dashed line) compared to the half-wave dipole (solid line). Using the above expression for the radiation in the far field for a given feedpoint current, we can integrate over all solid angle to obtain the total radiated power. Again, these become exact for L ≪ ½λ. Setting L = ½λ regardless, this formula would predict a radiation resistance of 49 Ω, rather than the actual value of 73 Ω applying to the half-wave dipole. The fundamental resonance of a thin linear conductor occurs at a frequency whose free-space wavelength is twice the wire's length, i.e. where the conductor is 1/2 wavelength long. Dipole antennas are frequently used at around that frequency and thus termed half-wave dipole antennas. This important case is dealt with in the next section. where λ = c/f is the wavelength and n is an integer. For a center-fed dipole, however, there is a great dissimilarity between n being odd or being even. Dipoles which are an odd number of half-wavelengths in length have reasonably low driving point impedances (which are purely resistive at that resonant frequency). However ones which are an even number of half-wavelengths in length, that is, an integer number of wavelengths in length, have a huge driving point impedance (albeit purely resistive at that resonant frequency). For instance, a full-wave dipole antenna can be made with two half-wavelength conductors placed end to end for a total length of approximately L = λ. This results in an additional gain over a half-wave dipole of about 2 dB, but the huge feedpoint impedance makes it unsuitable as a stand-alone antenna. A more practical antenna design is a bit longer. A 5/4-wave dipole antenna has a much lower but not purely resistive feedpoint impedance, which requires a matching network to the impedance of the transmission line. Its gain is about 3 dB greater than a half-wave dipole, the highest gain of any dipole of any similar length. Other reasonable lengths of dipole do not offer advantages and are seldom used. However the overtone resonances of a half-wave dipole antenna at odd multiples of its fundamental frequency are sometimes exploited. For instance, amateur radio antennas designed as half-wave dipoles at 7 MHz can also be used as 3/2-wave dipoles at 21 MHz; likewise VHF television antennas resonant at the low VHF television band (centered around 65 MHz) are also resonant at the high VHF television band (around 195 MHz). A half-wave dipole antenna consists of two quarter-wavelength conductors placed end to end for a total length of approximately L = λ/2. The magnitude of current in a standing wave along the dipole. Electric field of a half-wave dipole transmitting antenna. where k = 2π/λ and z runs from −L/2 to L/2. The directional factor cos[(π/2)cos θ]/sin θ is barely different from sin θ applying to the short dipole, resulting in a very similar radiation pattern as noted above. This equation can also be used for dipole antennas of other lengths, provided that Rradiation has been computed relative to the current maximum, which is not generally the same as the feedpoint current for dipoles longer than half-wave. Note that this equation breaks down when feeding an antenna near a current node, where cos(kx) approaches zero. Indeed, the driving point impedance rises greatly, but is nevertheless limited due to quadrature components of the elements' current which is ignored in the above model for the current distribution. The folded dipole is therefore well matched to 300 ohm balanced transmission lines, such as twin-feed ribbon cable. The folded dipole has a wider bandwidth than a single dipole. They can be used for transforming the value of input impedance of the dipole over a broad range of step-up ratios by changing the thicknesses of the wire conductors for the fed- and folded-sides. Instead of altering thickness or spacing, one can add a third parallel wire to increase the antenna impedance 9 times over a single-wire dipole, raising the impedance to 658 ohms, making a good match for window line feed cable, and further broadening the resonant frequency band of the antenna. Half-wave folded dipoles are often used for FM radio antennas; versions made with twin lead which can be hung on an inside wall often come with FM tuners. The T2FD antenna is a folded dipole. They are also widely used as driven elements for rooftop Yagi television antennas. There are numerous modifications to the shape of a dipole antenna which are useful in one way or another but result in similar radiation characteristics (low gain). This is not to mention the many directional antennas which include one or more dipole elements in their design as driven elements, many of which are linked to in the information box at the bottom of this page. The bow-tie antenna is a dipole with flaring, triangular shaped arms. The shape gives it a much wider bandwidth than an ordinary dipole. It is widely used in UHF television antennas. The cage dipole is a similar modification in which the bandwidth is increased by using fat cylindrical dipole elements made of a "cage" of wires (see photo). These are used in a few broadband array antennas in the medium wave and shortwave bands for applications such as over-the-horizon radar and radio telescopes. A halo antenna is a half-wave dipole bent into a circle. [a] With a horizontal circle, this produces horizontally polarized radiation in a nearly omnidirectional pattern with reduced power wasted toward the sky compared to a bare horizontal dipole. A turnstile antenna comprises two dipoles crossed at a right angle and feed system which introduces a quarter-wave phase difference between the currents along the two. With that geometry, the two dipoles do not interact electrically but their fields add in the far-field producing a net radiation pattern which is rather close to isotropic, with horizontal polarization in the plane of the elements and circular or elliptical polarization at other angles. Turnstile antennas can be stacked and fed in phase to realize an omnidirectional broadside array or phased for an end-fire array with circular polarization. The batwing antenna is a turnstile antenna with its linear elements widened as in a bow-tie antenna, again for the purpose of widening its resonant frequency and thus usable over a larger bandwidth, without re-tuning. When stacked to form an array the radiation is omnidirectional, horizontally polarized, and with increased gain at low elevations, making it ideal for television broadcasting. A ‘V’ (or “Vee”) antenna is a dipole with a bend in the middle so its arms are at an angle instead of co-linear. A Quadrant antenna is a ‘V’ antenna with an unusual overall length of a full wavelength, with two half-wave horizontal elements meeting at a right angle where it is fed. Quadrant antennas produce mostly horizontal polarization at low to intermediate elevation angles and have nearly omnidirectional radiation patterns. One implementation uses "cage" elements (see above); the thickness of the resulting elements lowers the high driving point impedance of a full-wave dipole to a value that accommodates a reasonable match to open wire lines and increases the bandwidth (in terms of SWR) to a full octave. They are used for HF band transmissions. The G5RV Antenna is a dipole antenna fed indirectly, through a carefully chosen length of 300Ω or 450Ω twin lead, which acts as an impedance matching network to connect (through a balun) to a standard 50Ω coaxial transmission line. The sloper antenna is a slanted vertical dipole antenna attached to the top of a single tower. The element can be center-fed or can be end-fed as an unbalanced monopole antenna from a transmission line at the top of the tower, in which case the monopole's "ground" connection can better be viewed as a second element comprising the tower and/or transmission line shield. The inverted "V" antenna is likewise supported using a single tower but is a balanced antenna with two symmetric elements angled toward the ground. It is thus a half-wave dipole with a bend in the middle. Like the sloper, this has the practical advantage of elevating the antenna but requiring only a single tower. The AS-2259 Antenna is an inverted-‘V’ dipole antenna used for local communications via Near Vertical Incidence Skywave (NVIS). dipole that radiates only in the upper half of space. The "vertical", "Marconi", or monopole antenna is a single-element antenna usually fed at the bottom (with the shield side of its unbalanced transmission line connected to ground). It behaves essentially as a dipole antenna. The ground (or ground plane) is considered to be a conductive surface which works as a reflector (see effect of ground). Vertical currents in the reflected image have the same direction (thus are not reflected about the ground) and phase as the current in the real antenna. The conductor and its image together act as a dipole in the upper half of space. Like a dipole, in order to achieve resonance (resistive feedpoint impedance) the conductor must be close to a quarter wavelength in height (like each conductor in a half-wave dipole). ohms. Another way of seeing this, is that a true dipole receiving a current I has voltages on its terminals of +V and -V, for an impedance across the terminals of 2V/I, whereas the comparable vertical antenna has the current I but an applied voltage of only V.
Since the fields above ground are the same as for the dipole, but only half the power is applied, the gain is doubled to 5.14 dBi. This is not an actual performance advantage per se, since in practice a dipole also reflects half of its power off the ground which (depending on the antenna height and sky angle) can augment (or cancel!) the direct signal. The vertical polarization of the monopole (as for a vertically oriented dipole) is advantageous at low elevation angles where the ground reflection combines with the direct wave approximately in phase. The earth acts as a ground plane, but it can be a poor conductor leading to losses. Its conductivity can be improved (at cost) by laying a copper mesh. When an actual ground is not available (such as in a vehicle) other metallic surfaces can serve as a ground plane (typically the vehicle's roof). Alternatively, radial wires placed at the base of the antenna can form a ground plane. For VHF and UHF bands, the radiating and ground plane elements can be constructed from rigid rods or tubes. Using such an artificial ground plane allows for the entire antenna and "ground" to be mounted at an arbitrary height. One common modification has the radials forming the ground plane sloped down, which has the effect of raising the feedpoint impedance to around 50 ohms, matching common coaxial cable. No longer being a true ground, a balun (such as a simple choke balun) is then recommended. Animation showing the sinusoidal standing waves of voltage, V, and current, I, on a half-wave dipole driven by an AC voltage at its resonant frequency. The feedpoint impedance of a dipole antenna is sensitive to its electrical length and feedpoint position. Therefore, a dipole will generally only perform optimally over a rather narrow bandwidth, beyond which its impedance will become a poor match for the transmitter or receiver (and transmission line). The real (resistive) and imaginary (reactive) components of that impedance, as a function of electrical length, are shown in the accompanying graph. The detailed calculation of these numbers are described below. Note that the value of the reactance is highly dependent on the diameter of the conductors; this plot is for conductors with a diameter of 0.001 wavelengths. Dipoles that are much smaller than the wavelength of the signal are called short dipoles. These have a very low radiation resistance (and a high capacitive reactance) making them inefficient antennas. More of a transmitter's current is dissipated as heat due to the finite resistance of the conductors which is greater than the radiation resistance. However they can nevertheless be practical receiving antennas for longer wavelengths. Dipoles whose length is approximately half the wavelength of the signal are called half-wave dipoles and are widely used as such or as the basis for derivative antenna designs. These have a radiation resistance which is much greater, closer to the characteristic impedances of available transmission lines, and normally much larger than the resistance of the conductors, so that their efficiency approaches 100%. In general radio engineering, the term dipole, if not further qualified, is taken to mean a center-fed half-wave dipole. where λ is the free-space wavelength, c is the speed of light in free space, v is the speed of the electric wave in the wire[dubious – discuss], and f is the frequency. The adjustment factor k which causes feedpoint reactance to be eliminated, depends on the diameter of the conductor. For thin wires (diameter, 0.00001 wavelengths), k is approximately 0.98; for thick conductors (diameter, 0.008 wavelengths), k drops to about 0.94. This is because the effect of antenna length on reactance is much greater for thinner conductors. For the same reason, antennas with thicker conductors have a wider operating bandwidth over which they attain a practical standing wave ratio. For a typical k of about 0.95, the above formula is often written for a length in metres of 143/f or a length in feet of 468/f where f is the frequency in megahertz. Dipole antennas of lengths approximately equal to any odd multiple of ​1⁄2 λ are also resonant, presenting a small reactance (which can be cancelled by a small length adjustment). However these are rarely used. One size that is more practical though is a dipole with a length of ​5⁄4 wavelengths. Not being close to ​3⁄2 wavelengths, this antenna's impedance has a large (negative) reactance and can only be used with an impedance matching network (or "antenna tuner"). It is a desirable length because such an antenna has the highest gain for any dipole which isn't a great deal longer. Three dimensional radiation pattern of a vertical half-wave dipole antenna. Radiation pattern of vertical half-wave dipole; vertical section. to zero on the axis. Its radiation pattern in three dimensions (see figure) would be plotted approximately as a toroid (doughnut shape) symmetric about the conductor. When mounted vertically this results in maximum radiation in horizontal directions. When mounted horizontally, the radiation peaks at right angles (90°) to the conductor, with nulls in the direction of the dipole. Neglecting electrical inefficiency, the antenna gain is equal to the directive gain, which is 1.5 (1.76 dBi) for a short dipole, increasing to 1.64 (2.15 dBi) for a half-wave dipole. For a 5/4 wave dipole the gain further increases to about 5.2 dBi, making this length desirable for that reason even though the antenna is then off-resonance. Longer dipoles than that have radiation patterns that are multi-lobed, with poorer gain (unless they are much longer) even along the strongest lobe. Other enhancements to the dipole (such as including a corner reflector or an array of dipoles) can be considered when more substantial directivity is desired. Such antenna designs, although based on the half-wave dipole, generally acquire their own names. Ideally, a half-wave dipole should be fed using a balanced transmission line matching its typical 65–70 Ω input impedance. Twin lead with a similar impedance is available but seldom used and does not match the balanced antenna terminals of most radio and television receivers. Much more common is the use of common 300 Ω twin lead in conjunction with a folded dipole. The driving point impedance of a half-wave folded dipole is 4 times that of a simple half-wave dipole, thus closely matching that 300 Ω characteristic impedance. Most FM broadcast band tuners and older analog televisions include balanced 300 Ω antenna input terminals. However twin lead has the drawback that it is electrically disturbed by any other nearby conductor (including earth); it is never used for transmitting. Many types of coaxial cable (or "coax") have a characteristic impedance of 75 Ω, which would otherwise be a good match for a half-wave dipole. However coax is a single-ended line whereas a center-fed dipole expects a balanced line (such as twin lead). By symmetry, one can see that the dipole's terminals have an equal but opposite voltage, whereas coax has one conductor grounded. Using coax regardless results in an unbalanced line, in which the currents along the two conductors of the transmission line are no longer equal and opposite. Since you then have a net current along the transmission line, the transmission line becomes an antenna itself, with unpredictable results (since it depends on the path of the transmission line). This will generally alter the antenna's intended radiation pattern, and change the impedance seen at the transmitter or receiver. A balun is required to use coaxial cable with a dipole antenna. The balun transfers power between the single-ended coax and the balanced antenna, sometimes with an additional change in impedance. A balun can be implemented as a transformer which also allows for an impedance transformation. This is usually wound on a ferrite toroidal core. The toroid core material must be suitable for the frequency of use, and in a transmitting antenna it must be of sufficient size to avoid saturation. Other balun designs are mentioned below. A so-called current balun uses a transformer wound on a toroid or rod of magnetic material such as ferrite. All of the current seen at the input goes into one terminal of the balanced antenna. It forms a balun by choking common-mode current. The material isn't critical for 1:1 because there is no transformer action applied to the desired differential current. A related design involves two transformers and includes a 1:4 impedance transformation. A coax balun is a cost-effective method of eliminating feeder radiation, but is limited to a narrow set of operating frequencies. One easy way to make a balun is to use a length of coaxial cable equal to half a wavelength. The inner core of the cable is linked at each end to one of the balanced connections for a feeder or dipole. One of these terminals should be connected to the inner core of the coaxial feeder. All three braids should be connected together. This then forms a 4:1 balun, which works correctly at only a narrow band of frequencies. At VHF frequencies, a sleeve balun can also be built to remove feeder radiation. Another narrow-band design is to use a λ/4 length of metal pipe. The coaxial cable is placed inside the pipe; at one end the braid is wired to the pipe while at the other end no connection is made to the pipe. The balanced end of this balun is at the end where no connection is made to the pipe. The λ/4 conductor acts as a transformer, converting the zero impedance at the short to the braid into an infinite impedance at the open end. This infinite impedance at the open end of the pipe prevents current flowing into the outer coax formed by the outside of the inner coax shield and the pipe, forcing the current to remain in the inside coax. This balun design is impractical for low frequencies because of the long length of pipe that will be needed. One of the most common applications of the dipole antenna is the rabbit ears or bunny ears television antenna, found atop broadcast television receivers. It is used to receive the VHF terrestrial television bands, consisting in the US of 54 to 88 MHz (band I) and 174 to 216 MHz (band III), with wavelengths of 5.5 to 1.4 m. Since this frequency range is much wider than a single fixed dipole antenna can cover, it is made with several degrees of adjustment. It is constructed of two telescoping rods that can each be extended out to about 1 m length (one quarter wavelength at 75 MHz). With control over the segments' length, angle with respect to vertical, and compass angle, one has much more flexibility in optimizing reception than available with a rooftop antenna even if equipped with an antenna rotor. In contrast to the wide television frequency bands, the FM broadcast band (88-108 MHz) is narrow enough that a dipole antenna can cover it. For fixed use in homes, hi-fi tuners are typically supplied with simple folded dipoles resonant near the center of that band. The feedpoint impedance of a folded dipole, which is quadruple the impedance of a simple dipole, is a good match for 300Ω twin lead, so that is usually used for the transmission line to the tuner. A common construction is to make the arms of the folded dipole out of twin lead also, shorted at their ends. This flexible antenna can be conveniently taped or nailed to walls, following the contours of mouldings. Horizontal wire dipole antennas are popular for use on the HF shortwave bands, both for transmitting and shortwave listening. They are usually constructed of two lengths of wire joined by a strain insulator in the center, which is the feedpoint. The ends can be attached to existing buildings, structures, or trees, taking advantage of their heights. If used for transmitting, it is essential that the ends of the antenna be attached to supports through strain insulators with a sufficiently high flashover voltage, since the antenna's high-voltage antinodes occur there. Being a balanced antenna, they are best fed with a balun between the (coax) transmission line and the feedpoint. These are simple to put up for temporary or field use. But they are also widely used by radio amateurs and short wave listeners in fixed locations due to their simple (and inexpensive) construction, while still realizing a resonant antenna at frequencies where resonant antenna elements need to be of quite some size. They are an attractive solution for these frequencies when significant directionality is not desired, and the cost of several such resonant antennas for different frequency bands, built at home, may still be much less than a single commercially produced antenna. Antennas for MF and LF radio stations are usually constructed as mast radiators, in which the vertical mast itself forms the antenna. Although mast radiators are most commonly monopoles, some are dipoles. The metal structure of the mast is divided at its midpoint into two insulated sections to make a vertical dipole, which is driven at the midpoint. Many types of array antennas are constructed using multiple dipoles, usually half-wave dipoles. The purpose of using multiple dipoles is to increase the directional gain of the antenna over the gain of a single dipole; the radiation of the separate dipoles interferes to enhance power radiated in desired directions. In arrays with multiple dipole driven elements, the feedline is split using an electrical network in order to provide power to the elements, with careful attention paid to the relative phase delays due to transmission between the common point and each element. For a vertically oriented dipole, which has an omnidirectional radiation pattern in the horizontal plane, it is possible to stack dipoles end-to-end fed in phase, creating a collinear antenna array. The array still has an omnidirectional pattern, but more power is radiated in the desired horizontal directions and less at large angles up into the sky or down toward the Earth. Collinear arrays are used in the VHF and UHF frequency bands at which the size of the dipoles are small enough so several can be stacked on a mast. They are a practical and higher-gain alternative to quarter-wave ground plane antennas used in fixed base stations for mobile two-way radios, such as police, fire, and taxi dispatchers. 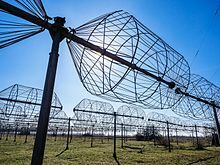 A reflective array antenna for radar consisting of numerous dipoles fed in-phase (thus realizing a broadside array) in front of a large reflector (horizontal wires) to make it uni-directional. This large reflector can be avoided in the end-fire array. In this case the dipoles are again side by side, but are fed in different phases. Rather than being directive perpendicular to the line connecting their feedpoints, now the directivity is along the line connecting their feedpoints. By using an appropriate spacing and phasing, the radiation can be directed in a single direction along that line, with radiation mainly cancelled in the reverse direction as well as most other directions. The above described antennas with multiple driven elements require a complex feed system of signal splitting, phasing, distribution to the elements, and impedance matching. A different sort of end-fire array which is much more often used is based on the use of so-called parasitic elements. In the popular high-gain Yagi antenna, only one of the dipoles is actually connected electrically, but the others receive and reradiate power supplied by the driven element. This time, the phasing is accomplished by careful choice of the lengths as well as positions of the parasitic elements, in order to concentrate gain in one direction and largely cancel radiation in the opposite direction (as well as all other directions). Although the realized gain is less than a driven array with the same number of elements, the simplicity of the electrical connections makes the Yagi more practical for consumer applications. Antenna gain is frequently measured as decibels relative to a half-wave dipole. One reason is that practical antenna measurements need a reference strength to compare the field strength of an antenna under test at a particular distance to. Of course there is no such thing as an isotropic radiator, but the half-wave dipole is well understood and behaved, and can be constructed to be nearly 100% efficient. It is also a fairer comparison, since the gain obtained by the dipole itself is essentially "free," given that almost no antenna design has a smaller directive gain. For a gain measured relative to a dipole, one says the antenna has a gain of "x dBd" (see decibel). More often, gains are expressed relative to an isotropic radiator, often for advertising reasons as this makes the gain appear higher. In consideration of the known gain of a half-wave dipole, 0 dBd is defined as 2.15 dBi; all gains in dBi are 2.15 higher than gains in dBd. Hertzian dipole of tiny length δℓ, with current I, and field sensed at a distance r in the θ direction. The Hertzian dipole or elementary doublet refers to a theoretical construction, rather than a physical antenna design: It is an idealized tiny segment of conductor carrying a RF current with constant amplitude and direction along its entire (short) length; a real antenna can be modeled as the combination of many Hertzian dipoles laid end-to-end. , the resulting field pattern then reduces to an integral over the path of an antenna conductor (modeled as a thin wire). where ζ0 = √​μ0⁄ε0 is the impedance of free space. Animated diagram showing E and H field in xy-plane based on time and distance. This solution includes near field terms which are very strong near the source but which are not radiated. As seen in the accompanying animation, the E and H fields very close to the source are almost 90° out of phase, thus contributing very little to the Poynting vector by which radiated flux is computed. The near field solution for an antenna element (from the integral using this formula over the length of that element) is the field that can be used to compute the mutual impedance between it and another nearby element. Electric field lines and magnetic field components at right angles composing the electromagnetic wave radiated by the current element. The far field pattern is thus seen to consist of a transverse electromagnetic (TEM) wave, with electric and magnetic fields at right angles to each other and at right angles to the direction of propagation (the direction of r, as we assumed the source to be at the origin). The electric polarization, in the θ direction, is coplanar with the source current (in the Z direction), while the magnetic field is at right angles to that, in the φ direction. It can be seen from these equations, and also in the animation, that the fields at these distances are exactly in phase. Both fields fall according to ​1⁄r, with the power thus falling according to ​1⁄r2 as dictated by the inverse square law. This method can be used to compute the radiation resistance for any antenna whose far field radiation pattern has been found in terms of a specific antenna current. If ohmic losses in the conductors are neglected, the radiation resistance (considered relative to the feedpoint) is identical to the resistive (real) component of the feedpoint impedance. Unfortunately this exercise tells us nothing about the reactive (imaginary) component of feedpoint impedance, whose calculation is considered below. The commonly quoted antenna "gain", meaning the peak value of the gain pattern (radiation pattern), is found to be 1.5~1.76 dBi, lower than practically any other antenna configuration. 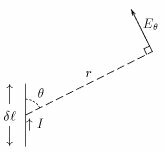 The Hertzian dipole is similar to but differs from the short dipole, discussed above. In both cases the conductor is very short compared to a wavelength, so the standing wave pattern present on a half-wave dipole (for instance) is absent. However, with the Hertzian dipole we specified that the current along that conductor is constant over its short length. This makes the Hertzian dipole useful for analysis of more complex antenna configurations, where every infinitesimal section of that real antenna's conductor can be modelled as a Hertzian dipole with the current found to be flowing in that real antenna. However a short conductor fed with a RF voltage will not have a uniform current even along that short range. Rather, a short dipole in real life has a current equal to the feedpoint current at the feedpoint but falling linearly to zero over the length of that short conductor. By placing a capacitive hat, such as a metallic ball, at the end of the conductor, it is possible for its self capacitance to absorb the current from the conductor and better approximate the constant current assumed for the Hertzian dipole. But again, the Hertzian dipole is meant only as a theoretical construct for antenna analysis. if we had assumed an element current of I0. Consequently, it can be seen that the radiation resistance computed for the short dipole is one quarter of that computed above for the Hertzian dipole. But their radiation patterns (and gains) are identical. The impedance seen at the feedpoint of a dipole of various lengths has been plotted above, in terms of the real (resistive) component Rdipole and the imaginary (reactive) component jXdipole of that impedance. For the case of an antenna with perfect conductors (no ohmic loss), Rdipole is identical to the radiation resistance, which can more easily be computed from the total power in the far-field radiation pattern for a given applied current as we showed for the short dipole. The calculation of Xdipole is more difficult. where L is the full length of the dipole, z is the position along the dipole relative to the feedpoint, k is the wavenumber equal to 2π/λ (λ being the wavelength, λ=c/f for a wave traveling within the conductor, for which c is about 98% of the speed of light in free space), and A is an amplitude chosen to match an assumed driving point current by setting z = 0. The induced EMF method is dependent on the assumption of a sinusoidal current distribution, delivering an accuracy better than about 10% as long as the wavelength to element diameter ratio is greater than about 60. However, for yet larger conductors numerical solutions are required which solve for the conductor's current distribution (rather than assuming a sinusoidal pattern). This can be based on approximating solutions for either Pocklington's integrodifferential equation or the Hallén integral equation. These approaches also have greater generality, not being limited to linear conductors. Numerical solution of either is performed using the moment method solution which requires expansion of that current into a set of basis functions; one simple (but not the best) choice, for instance, is to break up the conductor into N segments with a constant current assumed along each. After setting an appropriate weighting function the cost may be minimized through the inversion of a NxN matrix. Determination of each matrix element requires at least one double integration involving the weighting functions, which may become computationally intensive. These are simplified if the weighting functions are simply delta functions, which corresponds to fitting the boundary conditions for the current along the conductor at only N discrete points. Then the N×N matrix must be inverted, which is also computationally intensive as N increases. In one simple example, Balanis (2011) performs this computation to find the antenna impedance with different N using Pocklington's method, and finds that with N > 60 the solutions approach their limiting values to within a few percent. ^ Crucially, a halo antenna has no electrical connection between the two ends that are bent close together, unlike a loop antenna. ^ This computation using the induced EMF method is identical to the computation of the mutual impedance between two dipoles (with infinitesimal conductor radius) separated by the distance a. Because the field at or beyond the edge of an antenna's cylindrical conductor at a distance a is only dependent on the current distribution along the conductor, and not the radius of the conductor, that field is used to compute the mutual impedance between that filamentary antenna and the actual position of the conductor with a radius a. This then supplies the self-impedance of the conductor itself. ^ a b Winder, Steve; Carr, Joseph (2002). Newnes Radio and RF Engineering Pocket Book (3rd ed.). Newnes. p. 4. ISBN 0080497470. ^ K. Hille (DL1VU). Der Dipol in Theorie und Praxis. ^ a b c d Basu, Dipak (2010). Dictionary of Pure and Applied Physics (2nd ed.). CRC Press. p. 21. ISBN 1420050222. ^ Bodnar, Donald (1993). ANSI/IEEE Std 145-1993 IEEE Standard Definitions of Terms for Antennas. New York, NY: The Institute of Electrical and Electronics Engineers, Inc. p. 10. 2.102 dipole antenna. Any one of a class of antennas producing a radiation pattern approximating that of an elementary electric dipole. Syn: doublet antenna. ^ a b "Dipole Antenna / Aerial tutorial". Resources. Radio-Electronics.com. Adrio Communications, Ltd. 2011. Retrieved 29 April 2013. ^ Rouse, Margaret (2003). "Dipole Antenna". Online IT Encyclopedia. whatis.techtarget.com. Retrieved 29 April 2013. ^ Balanis, Constantine A. (2011). Modern Antenna Handbook. John Wiley & Sons. p. 2.3. ISBN 1118209753. ^ a b c d Balanis, Constantine A. (2011). Modern Antenna Handbook. John Wiley and Sons. pp. 2–1. ISBN 1118209753. ^ a b Stutzman, Warren; Thiele, Gary (1981). Antenna Theory and Design. John Wiley & Sons, Inc. pp. 212–220. ISBN 0-471-04458-X. ^ a b Huggins, John. "Of fields and feedpoints". Hamradio.me. Retrieved 13 January 2017. ^ Stutzman, Warren L.; Thiele, Gary A. (2012). Antenna Theory and Design. John Wiley and Sons. pp. 74–75. ISBN 0470576642. ^ a b Kraus, John D. (1988). Antennas (2nd ed.). McGraw-Hill. p. 213. ISBN 0-07-035422-7. ^ a b c Silver, Samuel (1984). Microwave Antenna Theory and Design. pp. 98–99. ^ Mushiake, Yasuto (October 1954). "An Exact Impedance Step-Up Impedance-Ratio Chart of a Folded Antenna". IRE. Trans. Ant. Prop. AP-3 (4): 163. Retrieved 2014-01-10. ^ "Quadrant antenna diagram". US Navy Radio Communications - 1950s & 1960s. Navy shore station communication antennas. ^ Ross Beaumont (VK2KRB) (2016-05-13). "Single wire quadrant antenna: Horizontal omnidirectional shortwave aerial comparisons" (PDF). Sydney, Australia: Manly-Warringah Radio Society. ^ Balanis, Constantine A. (1982). Antenna Theory. John Wiley & Sons. p. 164. ISBN 0-471-59268-4. ^ Below 30 MHz, atmospheric noise is high; consequently, received power levels must be significantly above the thermal noise floor. The receiving antenna's inefficiency is masked by the higher power level. See Rohde, Communications Receivers, discussion on active antennas. ^ Amlaner, Charles J. Jr. (March 1979). "The design of antennas for use in radio telemetry". A Handbook on Biotelemetry and Radio Tracking: Proceedings of an International Conference on Telemetry and Radio Tracking in Biology and Medicine, Oxford, 20–22 March 1979. Elsevier. p. 254. Retrieved December 5, 2014. ^ Holland, R. "A Cost Effective Current-mode 1:1 Balun". ^ Holland, R. "A Cost Effective Current-mode 1:4 Balun". ^ a b c Lee, Kai Fong (1984). Principles of Antenna Theory. John Wiley & Sons Ltd. pp. 29, 42. ISBN 0-471-90167-9. ^ a b Silver, Samuel (1949). Microwave Antenna Theory and Design. pp. 92–94. ^ Caudron, F; Ouslimani, A (2011). "Chaotic behavior in receiver front-end limiters". Progress in Electromagnetics Research Letters. 23 (19–28): 23–24. http://www.ece.rutgers.edu/~orfanidi/ewa/ Electromagnetic Waves and Antennas, Sophocles J. Orfanidis.